I have received several questions about various aspects of these upgrades. However, I have also fielded questions about the construction of the workstation as a whole. The workstation is not one whole unit. I will say that again because I think it warrants repeating. The workstation is not one whole unit. I built it in three individual units. I edge glued 1x4 pine boards together to make my cabinets. Why? I did not have the capacity to deal with large sheet goods at the time so I worked within my limitations. The materials I will list in this post is for sheet goods because I assume plywood will be the material of choice for many. I routed 1/4" deep dadoes in each of the sides for the back and bottom panels. 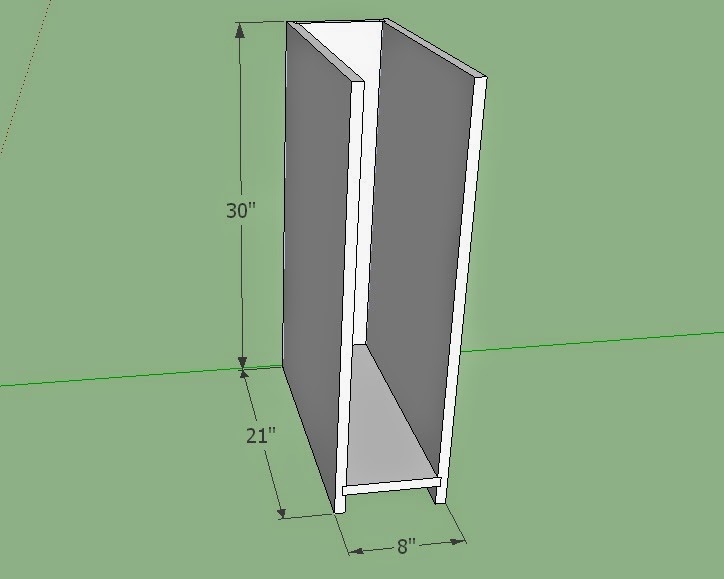 1 - 24" x 57"
2 - 2x4's @ 21"
2 - 2x4's @ 55-3/4"
Attach the casters while the base frame is laying flat on the floor. Then flip the base frame over. Once the individual units have been attached to each other, using 1-1/4" screws, lay it on it's back. Then position the base frame on the underside of the main carcass and attach using 2" screws. The size of the small side cabinet was dictated by the size of the space I had in our one car garage at the time. The space was 65" from the back wall to the corner of our car. I made sure the overall width of the workstation gave me enough room to walk between it and the car. If you have not done so already, be sure to stop by my Youtube channel. Find me on Facebook and Pinterest. All those links can be found in the side bar by clicking on the corresponding icon. Have fun and happy DIY'ing. Hi Stan, what software do you use for the 3D models? Thanks! 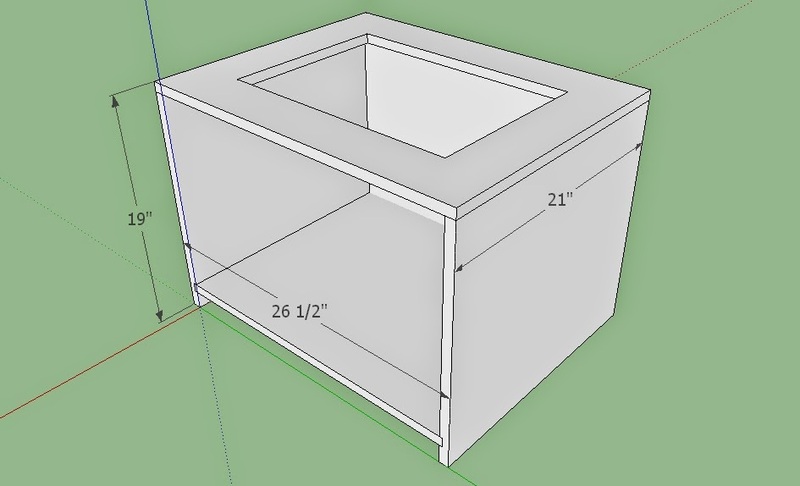 Hi, I mainly use the free version of Google Sketchup. A few extra steps have to be taken to get the images into a post but it works. Hey Stan. 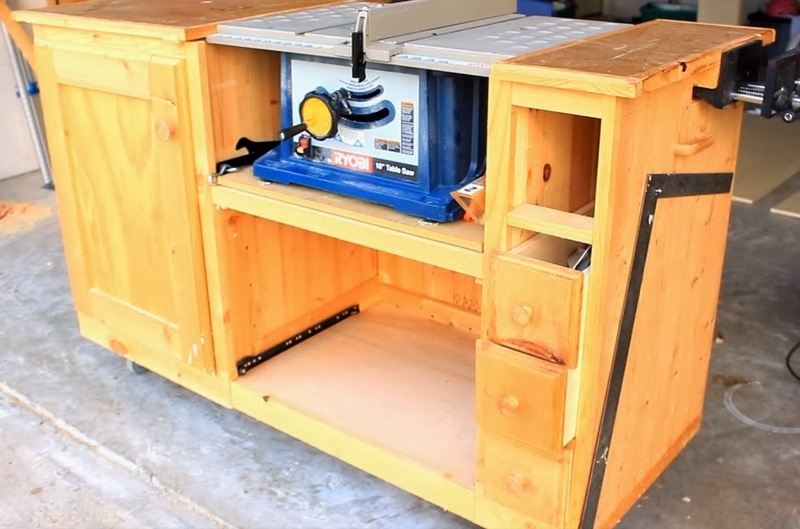 How do you make angled cuta on the table saw with the new top? Me personally? I don't. I do not like taking my blade out of square. I use a circular saw for angled cuts. However, if the intent of your question is, "how could you do it if you wanted to?" Just make a separate insert that isn't zero clearance. No different from any other Table saw top. Hey Stan! Great project... I'm assuming that all of these measurements are to fit the Ryobi RTS10 that's shown in the videos? Great Question. It is actually an over sized opening for a table saw so other models would probably fit. I wouldn't be able to tell you which ones as I do not know their measurements. I've got the same saw and have reached it's limitations on it's stand. 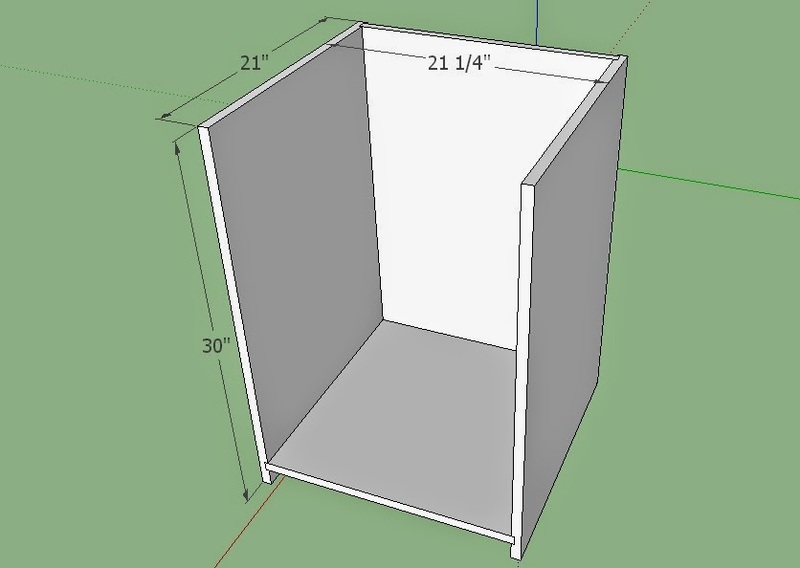 I think this project is going to happen this week. Awesome, have fun. Don't be stingy. Lets see the finished product. 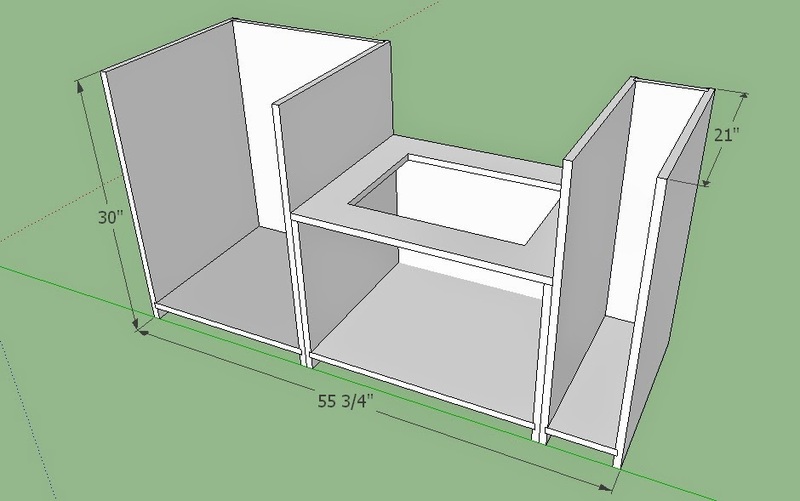 what would be the thickness of the plywood used in the plans for this workstation because i have the same saw and im looking to build a workstation for it. 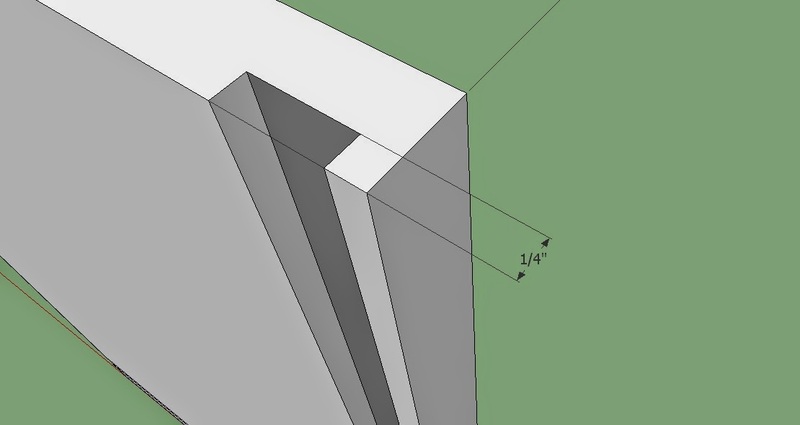 Board thickness will always be 3/4 inch for all projects on my website unless otherwise noted in the cut list. Suppose I should mention that somewhere huh. It's the little things that get bye a person sometimes. How high up are the bottom panels? I want to do this workbench so badly. Same question and did that effect the 2x4 base?